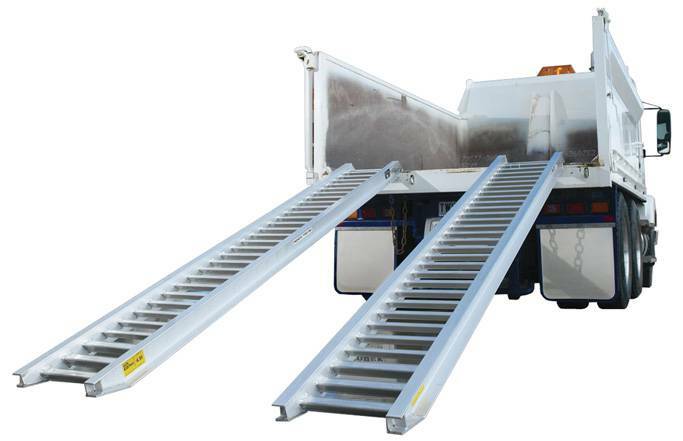 Since the release of Sureweld’s first N.A.T.A tested and certified Ramps in the early 1980’s the range has been expanded to meet almost any loading requirement in the mini to medium earthmoving industry. also offers the flexibility of custom-built designs which, as with all Sureweld Ramps, have safety factors well above industry expectations. From practical design and high build quality, right through to meticulous surface finishes, Sureweld Ramps are completed to the highest standard. All this is coupled with the fundamental objective of achieving the lightest possible Ramp weight for safe handling. Earthparts WA can also supply a range of ATV Ramps, Mower Ramps, Walk Boards and Custom Ramps. Not suitable for use with steel tracks or steel tracks with rubber pads. Suitable for Steel Tracks including steel tracks with Rubber Pads. Recommended for rubber tracks. Suitable but not optimum for rubber tyres. Suitable for use with All Surface Loader Rubber Tracks. Suitable for use with Pneumatic Tyres. Not recommended for use with Regular Rubber Tracks. Suitable for use with lightweight machinery such as ATV’s. Suitable for Pneumatic Tyres. Suitable for use with lightweight machinery such as Ride on Mower. Special curbed model for low clearance applications. For pricing or more information about the Sureweld Loading Ramps fill out the form and we&apos;ll be in touch soon. Alternatively call (08) 9457 1544.